Q&A with Sticks+Stones director Jerry Brown on the latest Washington Lottery campaign. Some stills from the shoot are below. What was the creative brief from the agency? The agency brief was to make a modern piece of film that didn’t smell too much like self-indulgent conspicuous consumption or advertising. With “Birds” they wrote a very pure and simple piece that required a natural approach. The whole point was to execute a story in a way that fit their objective of making spots people could feel good about, spots that hint at the good things lottery winners can accomplish – to show someone doing something for someone, that they couldn’t do for themselves. What did you like about this campaign? I love the free spiritedness of the campaign – especially “Birds”. The fresh, stripped down execution is what cuts to the core of the Washington Lottery strategy, which is all about getting people to look at the lottery in a new inconspicuous light. Five, maybe ten years ago, the “Birds” spot might have been a concept about a lottery winner buying a Lear Jet and blasting flightless birds around the globe sipping champagne. But, thankfully the days of “funny” lottery winners spending wildly seem to be winding down. The focus of this idea is squarely and most certainly on the birds, not the people. Were their any challenges from the shoot? Each spot had it’s own unique set of challenges. For “Birds” the challenges were technical – how to seamlessly composite birds with hang gliders and still make it all feel spontaneous, natural and observed. And then the weather decided to throw some curve balls at us just for fun. Essentially we rolled with the weather and stayed flexible doing an effects shoot that would have normally required a very inflexible approach and methodology. I think this flexible approach really shows on the film in a fantastic way. For “Tumbling” the challenges were technical in nature. We needed to shoot high speed and in budget, so through some careful testing we narrowed down the tools and chose a very smart Phantom HD camera solution and shot on a green-screen stage. What was it like working with the birds? The birds were amazing to work with. Probably the biggest challenge was that we were not allowed to actually fly with any of the birds, so for me the challenge was all about showing the birds enjoying “flight” from camera angles that while interesting, didn’t stretch credulity. 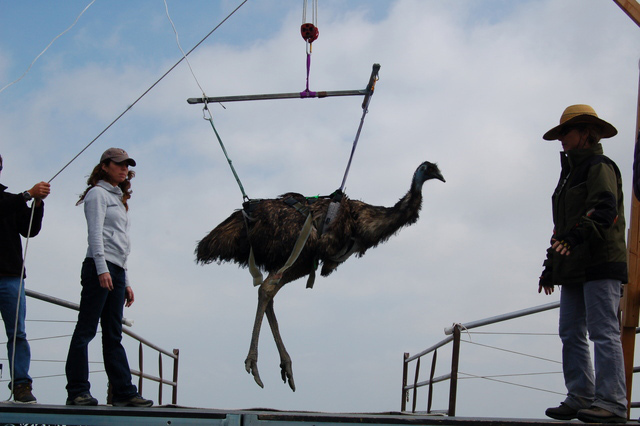 The animal trainers worked with the birds for more than a week; suspending them in harnesses and getting them used to being in their rigs. The still pictures I saw along the way were NOT encouraging and therefore I became a bit apprehensive. Then on the days we actually shot, the birds they performed amazingly. Unexpectedly, the chicken roosted on the hang-gliding bar, the penguin flapped its wings unlike it had ever done to that point, and the emu stayed suspended far longer than it tolerated previously. It was like they saved their best performances for shooting. I also learned that penguins can bite, and an emu doesn’t really relish having its feet suspended, even a foot off the ground, not to mention that it has a kick that will leave a permanent mark. We shot “Birds” at Joghin Ranch in Chatsworth, California in the San Fernando Valley, which was beautiful, but a location that had never been flown before. Tricky wind conditions were expected, but on the final day of “Birds” we had to move the shoot down the hill because the fog at the flight takeoff point was so dense you couldn’t see the other side of the parking area 20 feet away, let alone the landing zone. Then there was the unpredictability of animals – a rattlesnake den was discovered at one corner of our makeshift set on top of the hill, and one particularly snarly snake made an appearance every afternoon that the sun came out. 1st AD Chuck Connor (left), director Jerry Brown (centre), camera asst. Tom Miligan (right) discussing a shot set-up. 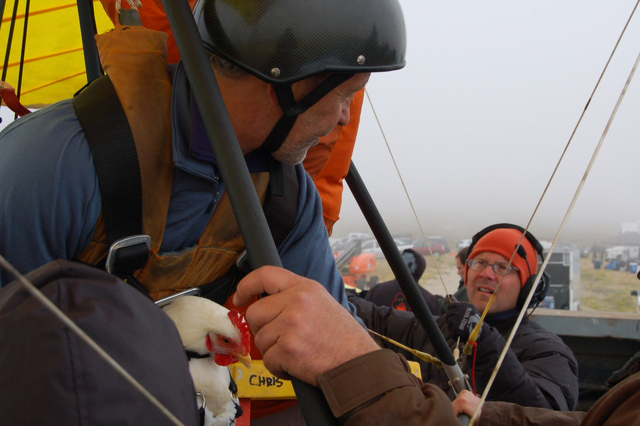 Director Jerry Brown (left), photographing hang glider pilot Joe Greblo in flight. Director Jerry Brown (left), operating camera, animal trainer Karin McElhatton (centre), hang glider pilot Joe Greblo (right). Camera Assistant Stephan Tarzan racking focus (Techno Crane) while hang glider pilot Joe Greblo flies with chicken (process shot). Director Jerry Brown (left), camera asst. Tom Miligan (right) rigging camera for a hand-held shot.